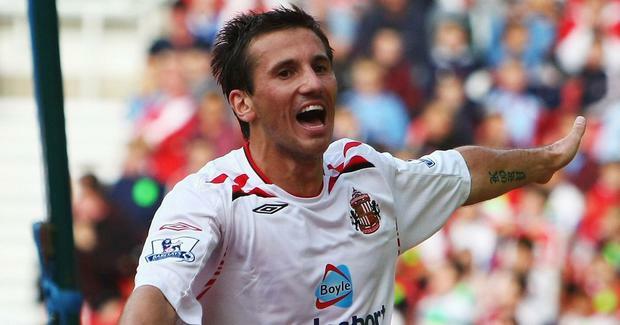 Liam Miller during his time at Sunderland. In life, Liam Miller wouldn’t have wanted the fuss and in death, his grieving family most assuredly would not want it either. He was a professional footballer who managed to do this most public of jobs whilst maintaining his privacy as a citizen. By all accounts an affable, modest fella, it was his tragically premature passing that made an indelible mark on the national consciousness. He died last February from pancreatic cancer, four days before his 37th birthday. His wife Clare, his children Kory, Leo and Belle, his parents and siblings, his extended family and friends, will be dealing with the pain of his loss for many years to come. Neighbourly support, the kindness of friends and strangers, will help them as it helps every bereaved family. In that spirit, a memorial match and black tie dinner has been organised in his honour; it is hoped that the proceeds will help secure the financial future of his wife and children. As a son of Cork, leading lights from the city’s business and political and sports communities have mobilised behind the project. It is being driven by property developer Michael O’Flynn, who is chairman of the organising committee. On Wednesday he was joined by Roy Keane and Lord Mayor Mick Finn and Cork City FC manager John Caulfield to formally launch the event. The match will be played on September 25. It will feature a Celtic and Ireland selection versus a Manchester United Legends eleven. Tickets were released for sale on Friday morning. And with an all-star cast featuring Ryan Giggs, Paul Scholes and Rio Ferdinand among others, it was no surprise that the tickets were snapped up within minutes. The other reason they disappeared is the venue. Turner’s Cross has a capacity of 7,000. One presumes that neither man wanted any rancour to intrude upon an event which will be precious and emotional for the Miller family. It would be entirely inappropriate to the memory of Liam, who in his own career was the very model of a quiet, respectful pro. The testimonial is essentially an act of kindness, a benevolent and good-hearted initiative by a community for a family it cherishes. Therefore to attach any controversy to it would appear unseemly. But controversy unfortunately has surrounded it and continues to simmer this weekend. On Thursday the Cork County Board said their hands were tied by the rules. On Friday Croke Park explained that everyone’s hands were tied by the rules. “The GAA is prohibited in rule from hosting games other than those under the control of the Association in its stadia and grounds,” said their statement in part. Now, if there’s anything we’ve learned about outmoded institutional rules, from Government bureaucracies to communist regimes to the Catholic Church, it is that human behaviour repeatedly exposes their innate absurdities. When proscriptive rules are rigidly implemented, they become incompatible with the lived experience of those who are supposed to conform to them. The rules start to crumble under the weight of their own severity. Often it is the institutions themselves that cannot meet the puritanical standard they’ve set. Changing circumstances, the evolving culture, force them into compromises that deviate from the letter of the law. People then see the creeping hypocrisy happening. The institution starts to lose credibility and moral authority. The rules in question become resented by the members, and in time ridiculed. They fall into disrepute and in the end they are either discarded or wholly ignored. This process has been happening to the institutional GAA for close on half a century, with regard to its stance on the proverbial ‘foreign games’. The people’s GAA were way ahead of them on this one. In the early 2000s it came to a crunch over the opening of Croke Park to rugby and soccer when Lansdowne Road was about to be closed for reconstruction. The institutional GAA, Cork County Board included, mounted a fierce and frequently undemocratic resistance to the groundswell pressure for change. Ultimately it was their own members who saved the institution from its monumental ideological folly. What we are seeing now with the Páirc Uí Chaoimh imbroglio is a continuation of this culture war, and another act of self-sabotage by the monolith. Inside the castle walls it is still perfectly logical to draft a statement saying: “The GAA is prohibited in rule . . .” Etcetera etcetera. Outside, this rule is about as relevant to GAA people as the Billings Method is to a newly-wed Catholic couple. And it becomes even more discredited when the GAA itself cannot stick to it. Last time we checked, American football wasn’t controlled by Central Council. And if Ireland had won the right to host the 2023 Rugby World Cup, the GAA’s best stadia nationwide would have been used, including Páirc Uí Chaoimh. And of course for three years, between 2007 and 2010, they repeatedly hosted the national rugby and national soccer teams in Croke Park. Lest it be forgotten, one of the players who wore green there was Liam Miller. He won four of his 21 international caps in Croke Park. It must have been a thrill for him, running out on the fabled sward, having played a bit of gah as a boy. His family will surely treasure those memories into the future on his behalf. For the present, it remains a troubling irony that a man who lived so privately in public, is now at the centre of a public quarrel despite resting in the ultimate privacy of his final abode. Independent.ie Newsdesk Tomás Ó Sé and Joe Brolly have called on the GAA to allow a charity event for the family of the late Ireland soccer international Liam Miller to take place at Páirc Uí Chaoimh. Donnchadh Boyle When the history of this great Dublin team comes to be written, a three-point win in Omagh is unlikely to be hard on the ink. Brian Lowry Meath claimed their first Leinster minor football title in 10 years on Saturday as they put in a clinical and composed performance in O’Connor Park, Tullamore, to comfortably account for Kildare.